When you become a parent you buy a membership to The Lifetime Worriers Club. When you become a Grandparent you earn a Platinum Card. I was thinking about what to do with my worries. Worry beads? I researched a bit and decided that would make me feel more obsessive. 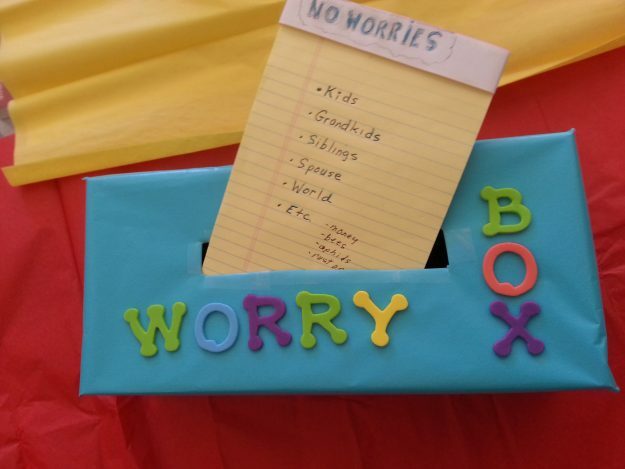 The idea of “worry box” came from somewhere and I googled it. Turns out it is a recommended technique for handling worrying about stuff. You can even buy an App for it. So instead of doing laundry, exercise, shower, or any other sundry list of things I could be doing, I made a worry box. It was kind of fun and took my mind off things for a bit. How do you handle your worries? And please don’t tell me you don’t have any, unless your name is Bob Marley. And I love my kids and grandkid very much, but I still worry about them. This entry was posted in Blogging, My Life and tagged #Coping, #Worry, Life on April 30, 2017 by Deborah Drucker. Not a bad idea. As long as you can’t open it. There is no end to my worry. I am medaling in worry. I looked them up after commenting, and they’re RATHER inexpensive. I ordered some again. Great post. I think I needed the reminder. Oh… Does it actually work? My mind just does not pause! That’s a much better way to deal with worries than mine. Personally, I tend to simply stew about them endlessly…. Not at all healthy!